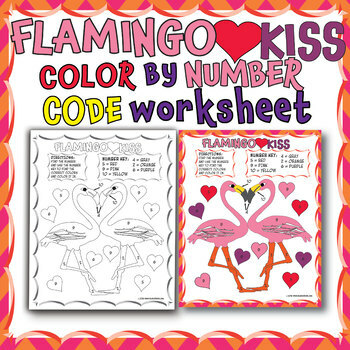 Build Math fluency with a FLAMINGO KISS COLOR BY NUMBER CODE activity page! REVIEW TROPICAL BIRDS LIKE THE FLAMINGO. Flamingoes are a wading bird from the family of Phoenicopteridae, the only bird family in the order Phoenicopteriformes. Four flamingo species are distributed throughout the Americas, including the Caribbean, and two kinds are native to Africa, Asia, and Europe. CELEBRATE VALENTINE'S DAY. Valentine's Day is a time to celebrate love. The origin is from the death of St. Valentine. Many people exchange cards known as valentines, chocolates and flowers...and flamingos! Our design is also available as tshirt for adults and kids on Amazon.